This shrub is native to the southeastern United States, found often as an ornamental in gardens and yards. Its average height is 3 to 5 feet, but it can grow up to 9 feet tall in favorable conditions. It has long, arching branches and yellow-green autumn foliage. The smooth bark is light brown on older wood, and reddish brown on younger plants. Flowers are small and pink, in dense clusters at the base of the leaves. 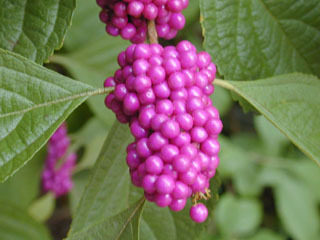 The most notable characteristic is the Beautyberry’s fruit, a pinkish-purple berry which appears in clusters. Many species of birds rely on the berries as a food source, and are also advantageous to the plant by distributing the seed. Foliage is also a favorite of the White Tailed Deer. The berries can be consumed by humans, but only in small quantities, because they are astringent. Roots are used to make an herbal tea. Crushing the beautyberry’s foliage is a folk remedy for repelling insects.